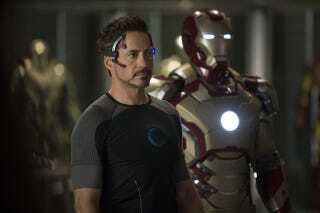 It's been largely assumed that the next Iron Man movie, if and when it comes, would no longer feature Robert Downey Jr. as Tony Stark. But now Downey's giving signs that he's plenty ready to stick around. It's down to Kevin [Feige, Marvel Studios president] and Ike [Perlmutter, CEO of Marvel Entertainment] and Disney to come to us with what the proposal is, and that's on us to agree or disagree,. When things are going great, there's a lot of agreement. Which sounds like code for "backing a dump truck full of money up to the front door." Which is understandable. It's nice to be the highest paid actor year after year. It's that thing of: why give up the belt when it feels like you can barely get jabbed?" he says — then adds a caveat. "Most people are saying that right when they get knocked out." Of course, there's an absolute refusal to make more of a commitment than that. The future, he says, is "uncertain."